Keeping your toddler as safe as possible on the road, in your car, is one of the highest priorities for parents. Cars can be especially dangerous for young children because of their fragility and low weight. There are a number of ways to keep them secure and protected in case of a collision, but this usually starts with buying the right car seat. At the top of the list of car safety precautions for your children, is purchasing the right car seat. Every parent should have a set of crucial requirements before buying their toddler a car seat. Here are the top 5 car seat buying tips. One of the first things to know when buying a car seat for your toddler is the difference between a convertible seat and a forward facing seat. For most toddlers at a certain weight, you must always purchase a forward facing seat. 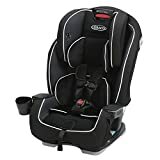 In most cases you want to keep your toddler in a forward facing seat until they reach the end of their toddler stage or until they reach around 2 years old. 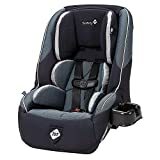 Check the weight requirements and specifications in the description of the car seat. You should also always purchase a 5-point harness. These harnesses go over your toddler’s shoulders, across the chess and over the thighs. Purchasing a car seat with a 5-point harness is the best way to keep your toddler the most secure in case of an accident. Many highways and safety boards recommend that parents use a 5-point harness over anything less. In some states it is required. You also want to make sure that there is adequate padding on the car seat you want to purchase. Because they are so strapped in – with a recommended inch of space around them – it can be very uncomfortable if your toddler does not have adequate padding. Toddlers are also very messy – you should think about purchasing a car seat with a machine washable cover. There are plenty of car safety tips for toddlers, but what about tips about how to keep your car seat the cleanest? One of the best options is finding a car seat that you can easily and conveniently wash. Most of the time it’s as simple as removing the outside fabric and throwing it in the washing machine. Lastly, you always want to make sure that there is a tether attachment that safely attaches the car seat to your car. Almost all new cars are required by the Transportation Board to have car tethers and the same with many new car seat manufacturers. A car tether is the safest way to keep your toddlers car seat connected to the seat of the car in case of a sudden change of speed or a collision. If you have an older car without a tether you can go to many car mechanics who can customize your seats so that you can meet some of the newer safety standards. If your child is not safely tethered they can be put in serious danger. Can’t afford a car seat? Make payments on a new car seat.